Observed intensity and direction of the polarization of the vector beam. A new study has demonstrated a method that produces novel light beams from synchrotron light sources, opening up a new way to generate X-ray beams. Structured light, created using the process of generating and applying light to a surface, is important in many of today's devices, such as 3D scanners, dual photography and microscopic technology. "We have demonstrated the generation of the vector beam using synchrotron radiation. This work has opened a way to generate X-ray vector beams," says co-author Prof. Masahiro Katoh of the Institute for Molecular Science (IMS) at the National Institutes of Natural Sciences/Sokendai in Japan. The production of structured light in the X-ray wavelengths has been challenging, however, and the new technique presented by the Japanese scientists can potentially allow for the use of such structured light in research areas accessible only with synchrotron radiation, such as X-ray absorption spectroscopy and X-ray crystallography. The scientists based their method on a technique that produces circularly polarized light from two linearly polarized ones whose polarization directions are orthogonal to each other. In synchrotron light sources, this method has been applied to uniformly polarized beams coming from two undulators. An undulator is a device that emits quasi-monochromatic light with various polarizations. 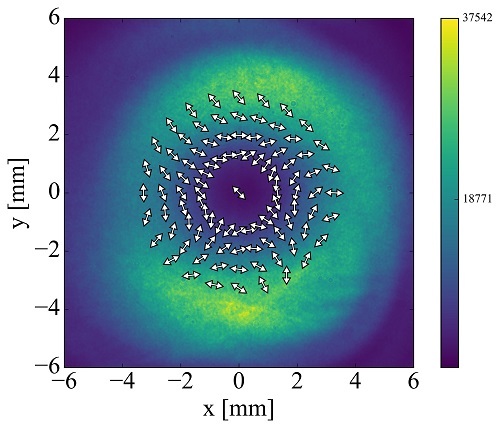 Matsuba and his team applied this method for two vortex beams coming from two helical undulators positioned in tandem. The research follows previous studies that have used lasers and optical components to create vector beams, with wavelengths usually within the visible or near-infrared portions of the electromagnetic spectrum. The findings were published in the journal of Applied Physics Letters in July 2018. Katoh goes on to explain that "the next step of this research is to demonstrate the generation of vector beams of other types, for example, radially polarized beams. Our ultimate goal is to control all the optical properties of synchrotron radiation, such as wavelength, coherence, spatial, temporal structures and so on." This will pave the way for new opportunities in many fields, including X-ray diffraction, scattering and absorption/emission spectroscopy due to the new method of generating structured light that has been demonstrated in this study. This work was supported by the Japanese Society for the Promotion of Science (JSPS), the Joint Research by the National Institutes of Natural Sciences (NINS) and IMS. The full research team involved in the study is as follows: Shunya Matsuba, Keigo Kawase and Atsushi Miyamoto of the Hiroshima Synchrotron Radiation Center, at Hiroshima University; Shigemi Sasaki of the Hiroshima Synchrotron Radiation Center and the School of Physical Science and Technology, at ShanghaiTech University; Masaki Fujimoto and Taro Konomi of the Institute for Molecular Science, at the National Institutes of Natural Sciences/Sokendai; Naoto Yamamoto and Masahito Hosaka of the Synchrotron Radiation Research Center at Nagoya University and Masahiro Katoh of the Institute for Molecular Science and the Synchrotron Radiation Research Center.